Have a safe and reliable source of standby power with the WEN 5,613K 13,000-Watt Portable Standby Generator with Wheel Kit and Electric Start. Get all the benefits of a standby generator without sacrificing the mobility of a portable unit. This EPA III certified generator provides a surge power of 13,000-Watt and a rated power of 11,000 rated Watts, making it the perfect source of backup power during emergencies and natural disasters. The 4-stroke OHV twin-cylinder motor produces both 120-Volt and 240-Volt output at 60 Hz, catering to a wide variety of electrical devices. This generator comes equipped with comprehensive safety features including a forced air cooling system and a low-oil shutoff to safeguard the unit from damage. The automatic voltage regulator helps create clean power to protect your electronics. The 8 Gal. fuel tank provides long-term operation with a 7.5 hour runtime at half load while the wheel and handle kit allows for easy transportation and storage. This generator includes four 120-Volt 20 Amp outlets, one 120-Volt 30 Amp RV outlet, one 120/240-Volt 30 Amp twist lock, one 120/240-Volt 50 Amp outlet and one cigarette-lighter-style 12-Volt DC outlet. And because this is a WEN product, your 13,000-Watt Portable Generator comes backed by a 2-year warranty, a friendly customer help line and a nationwide network of skilled service technicians. Tbook.com crawls the web to find the best prices and availability on Generators and related Tools and Hardware products like Wen 13,000-Watt Portable Standby Generator with Wheel Kit and Electric Start. For this page, related items include products we find that match the following keywords: "Generator GENERATOR" at our vendor partner Home Depot. 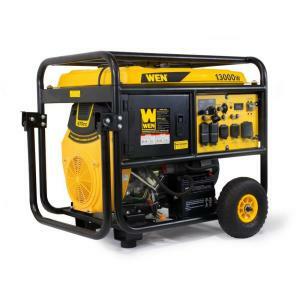 Wen 13,000-Watt Portable Standby Generator with Wheel Kit and Electric Start is one of 152 Generators and related products listed in the Tools and Hardware section of Tbook.com If you have any questions on this product, please give us a call at 734-971-1210 during the hours of 9am - 5pm EST for assistance. Thank you for shopping at Tbook.com, the Internet Department Store!